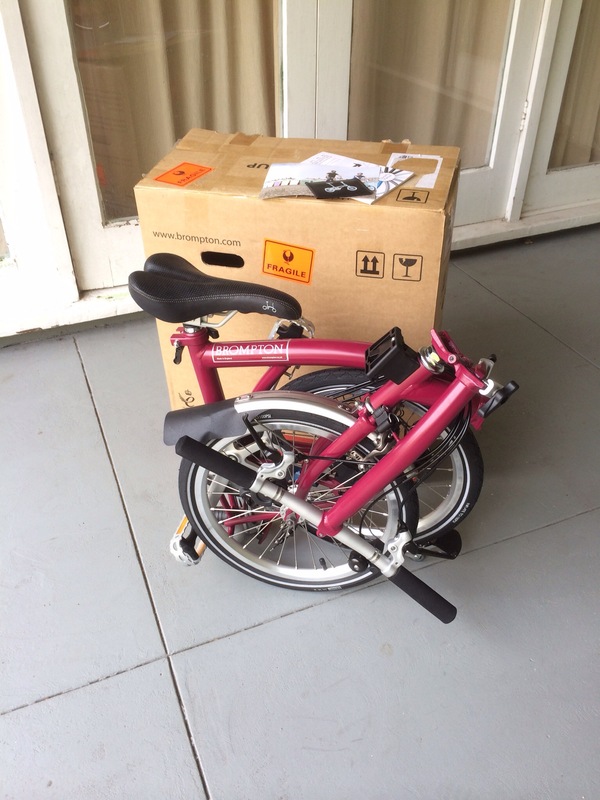 In my recent “New decisions” post I mentioned that a Claret Brompton (one of the colour choices that have just been replaced in the new colours range) was on its way to Australia in the next shipment – & it would be coming my way! Well, it’s happened & after Brompton’s Elves prepped it, yesterday “Clarence” arrived via a special courier delivery to supplement the Brompton family! The BAC weekend promised/included lots of tidbits & treats. 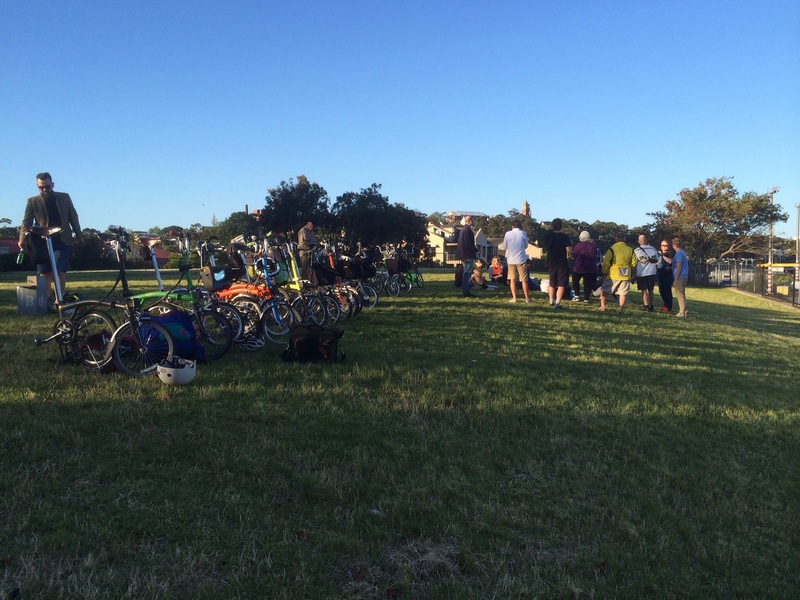 The first was a “Welcome to Sydney” ride on the Saturday. “If you’re travelling from interstate or overseas to race, or you’re a local, we’d like to welcome everyone to Sydney with a ride and get-together. 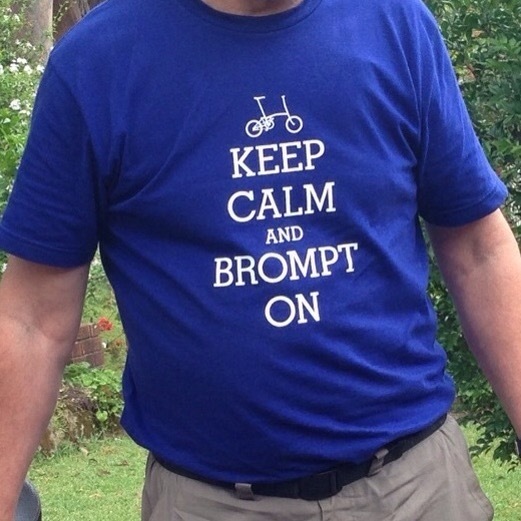 I don’t know how Brompton Australia do it? Everything stated above came off well, on a day of lovely weather. We met at CheekyT, chatted & kicked tyres endlessly until Adam led us through quiet back streets, lanes, cycle paths & bush tracks (I kid you not! How does he find them?). A convoy of about 30 Bromptons certainly got some attention through all the trails, with people stepping back to watch us glide through. Knowing our destination, didn’t help me determine where I was at any time; we were on a Brompton magical mystery tour. Arriving at the park just started the next phase of chats but this time on a grassy knoll overlooking waterfront sights towards the city. With such distractions I was oblivious to the beer delivery until an opened bottle was waved under my nose. Shortly after, a pile of pizza boxes appeared & we all tucked in. With a fine array of empty & near-empty boxes, it was then that I remembered to take some pics!? Sadly there seemed little appropriate for the blog post so I apologise for my limited selection from the afternoon/evening – but then, similar difficulties arose on Saturday so maybe we need a “nominated photographer” for such gatherings? Sunset & a cooling breeze were successful in breaking up the party & we dispersed to all corners of Sydney, mindful of the big challenges that lay ahead for Sunday. 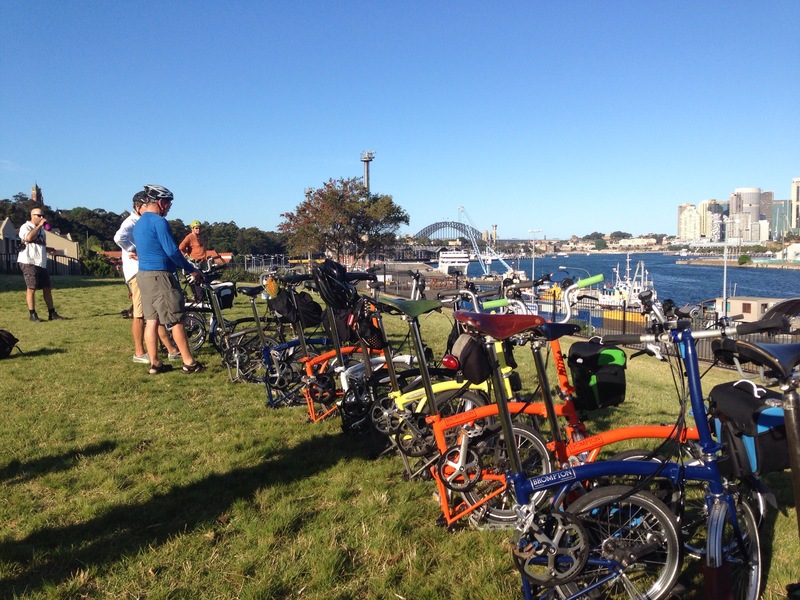 Thank you Brompton Australia, CheekyT & all the entertaining Bromptonauts! The inclusion of the BAC with the SOP cycling events was brilliant. 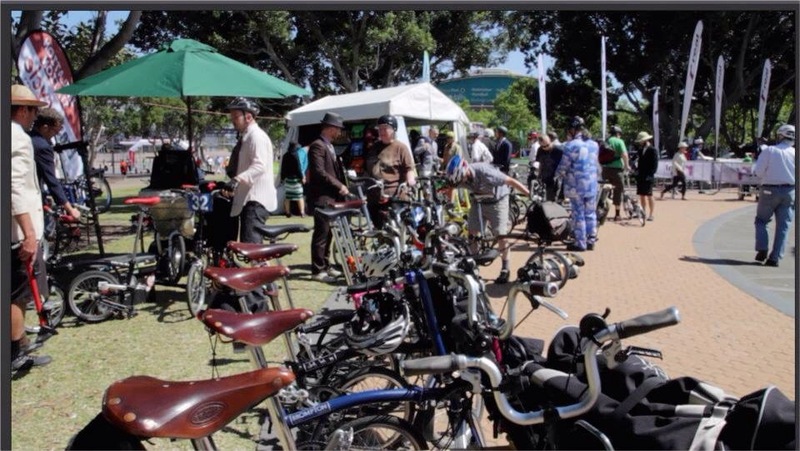 Lots of activities, displays & food stalls for various happenings: eg 50km cross-city family rides finishing at the park & club cycling criterium races – including the Brompton race. The location of the Brompton tent & displays was ideal: close to tree shade & the cooling spray from the Olympic Fountain, adjacent to all displays & food. Perfect publicity positioning!? My participation is in keeping with the race ideals, with attire, style & enjoyment to the fore & as usual, my racing would be at my rather slow pace! A max pace, mind you, but one that my restricted heart capacity would see me expecting to see lots of riders close-up – as they lapped me regularly? 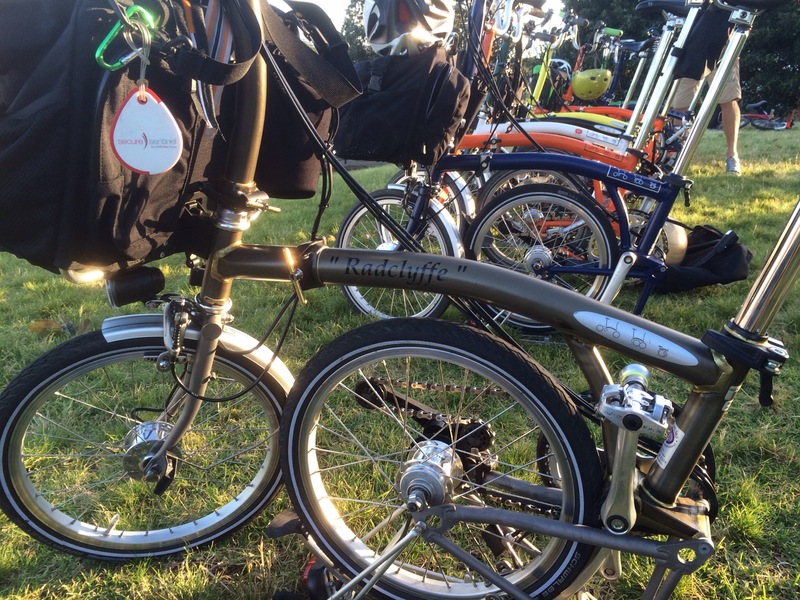 Our participation in the Brompton World Championship last year was a delight & an experience. Mixed up with nearly 700 Bromptons spread around the Goodwood Motor Circuit was a delight to the senses & an experience that suggested very careful consideration of the jacket portion of the required race attire? My traveling sports coat was quite comfortable but thoroughly unsuitable for ventilation. The wise heads would suggest an Op-shop jacket, stripped of its lining & even hacked open at the armpits? My search for a jacket for BAC 2014 was rather frustrating; nothing lightweight & stylish at Op-shops? on-line ordering totally baffling for size & likely weight? (After all, asking vendors for a jacket to suit BWC/BAC criteria is likely to be doomed? How about “stylish, light, cool, cheap & capable of coordination”?) When all seemed lost & about to revert to anything from the Op-shop situation, I found an outlet with my ideal: lightweight cotton, unlined, my size & discounted to the princely sum of $15 – magic! My ride would be complete! I have to confess that I never expected BAC to eventuate! My observation/experience is that Australian & NSW Cycling organizing bodies are hopelessly rule-driven & inflexible & wouldn’t want to help out? 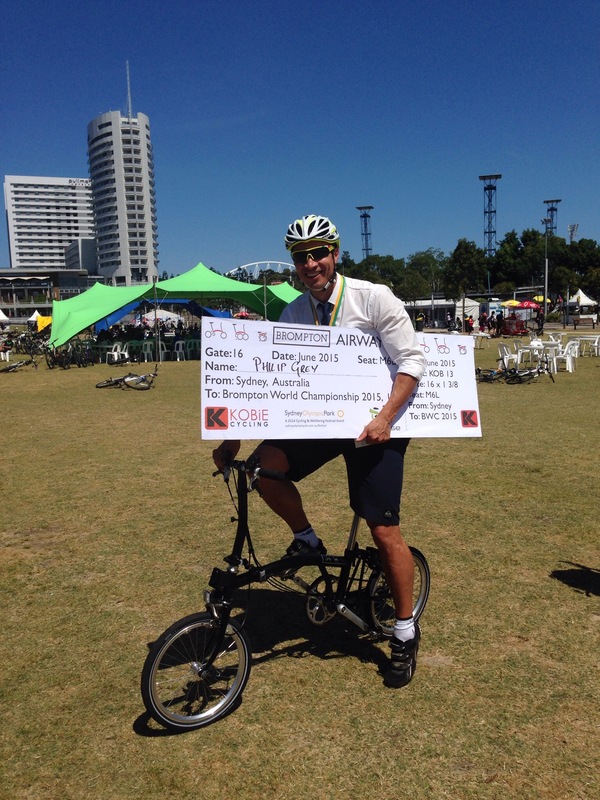 Fortunately, kudos to Lidcome-Auburn Cycling Club & Park Bikes for allowing Brompton Australia to slot in a race during their Cycling Club Cup events at Sydney Olympic Park! Now, don’t interpret these comments as a complaint but the event plans were a touch confusing! Initially advised as 5 laps of a 1.72km course later became a Crit of 30mins + 1 lap & then finally at the race briefing, 6 laps of the Crit course?! No problems; we had a race! 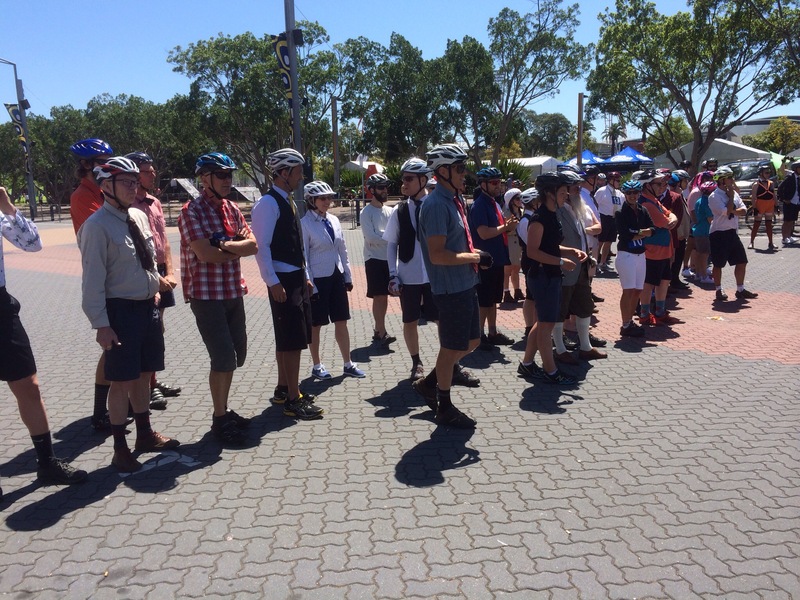 After the race briefing we were guided onto the circuit to the point we would fold our Bromptons (about 65? 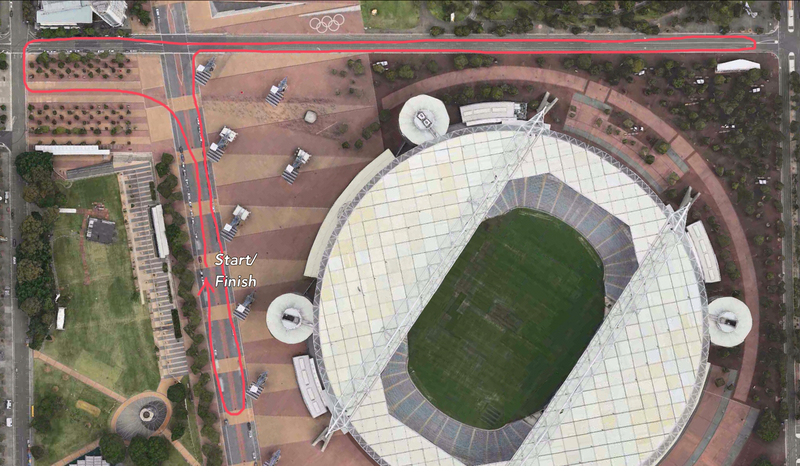 ), walk back down the track about 20 meters & await the start. 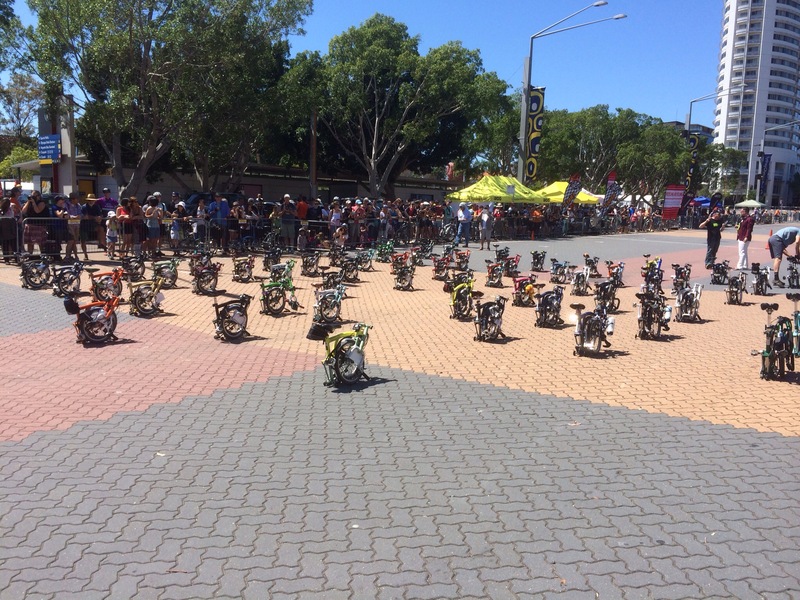 In keeping with Brompton Championships, the race commenced from a LeMans start, running to our bikes & unfolding them before proceeding along the course. Of course the race format also included a style factor of “jacket & tie mandatory”. For reasons unknown to me, the race briefing included an opt-out for jacket wearing!? Yes, a warm day but not overly hot & many bounders took advantage of this weakening of dress rules! Just not cricket? And so to the race… Not the greatest of unfolds for me but that’s definitely relative; some people needed assistance to finally get mobile? My race strategy was no different to other rides; pedal fast until leg fatigue forces me to back off a bit & then just keep going – & watch the action around me while staying out of the way? Do consistent timed laps but consider pulling out if my times drop away (for me, not a good idea to overdo things?). However, using my Garmin as my guide went awry! First, I forgot to reset it from the morning ride & had no idea of my first lap time. Then I found I couldn’t read the Garmin with it vibrating badly on the pavé along the start/finish area! Not only had I lost my lap-time references, I’d lost my lap counter. With lots of riders overtaking & the race update commentary over the PA system, I lost track of my laps & pulled off once the leaders had finished. Well, that’s my excuse for not doing all the laps (& unlike the BWC, I had no race-recorded time & no finisher’s medal to ride for). 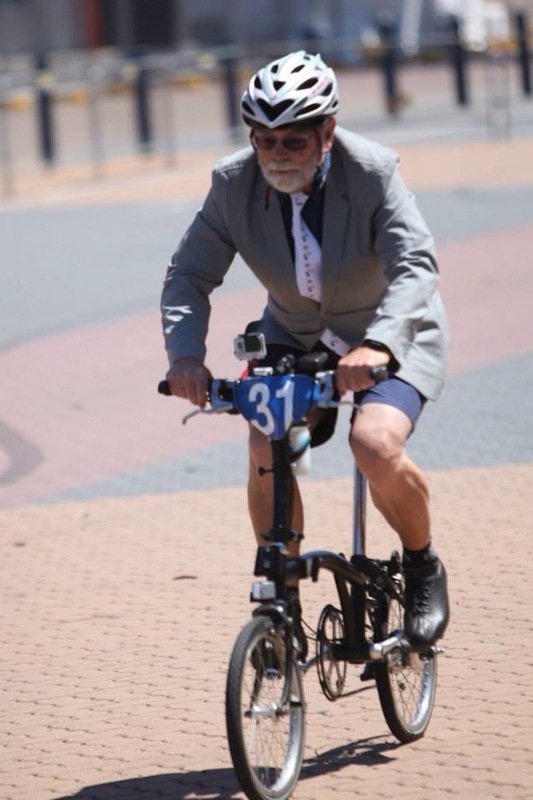 A very entertaining ride; I liked being able to see other riders & their Bromptons, both when being lapped & when coming back from the hairpin turns – & as you may notice in my YouTube video BAC 2014, my pace doesn’t trouble the leaders! Of course, the post-race activities primarily involved chatting but also found time for a Brompton folding competition & the awards presentation. 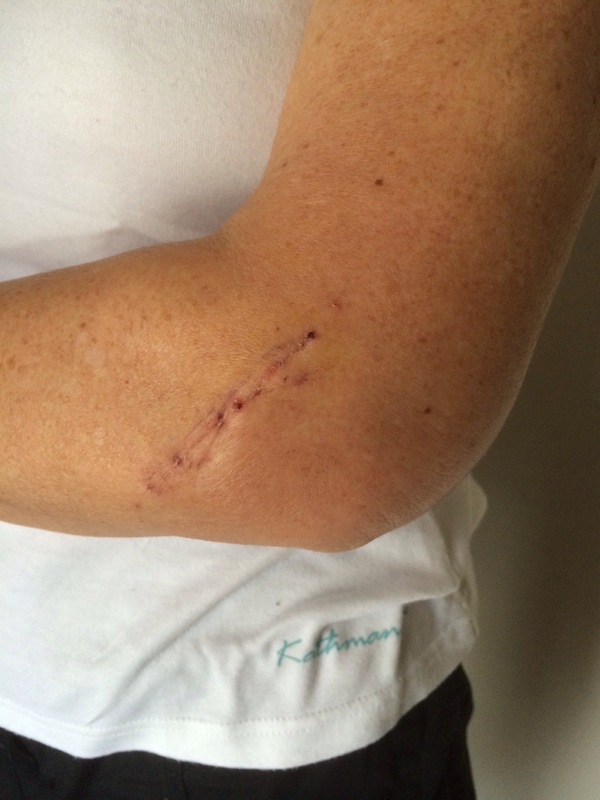 Surgery successful to relocate & pin a piece of the left elbow radius head. Everything stiff & sore but movement increasing & “nearly able” to hold a coffee cup – & scratch her nose? Driving the Tardis (manual gear change) or riding Peregrine probably won’t happen this year? CT scan soon to review still painful hip?